The average factory in the U.S. is 600,000 square feet. Many of them contain between 5,000 to 12,000 feet of safety & organizational lines (most of them painted.) BUT... more companies than ever are choosing floor tape over paint...and for good reasons. Floor painting can require a range of additional tools and products, from rollers to industraial paint sprayers. Waiting for paint to dry can cause significant downtime and can sometimes shut down entire factory floors for days, often times resulting in large monetary losses and delayed workflow. Industrial floor tapes bond immediately after install, without having to wait for paint to dry or having to clear the air of toxic, dangerous fumes. SafetyTac® is the leading brand of industrial floor marking tapes for good reason- It’s strong enough to hold up to forklift traffic as well as outlast paint and all other floor tapes on the market. Call 1-866-777-1360 for a free sample. Many businesses have started using industrial floor tape in place of paint because it’s easy to install (so it causes very little downtime) and it’s durable. It can hold up to foot and vehicle traffic, it doesn’t fade, and it’s easy to clean. See why you should consider industrial floor tape in this infographic. 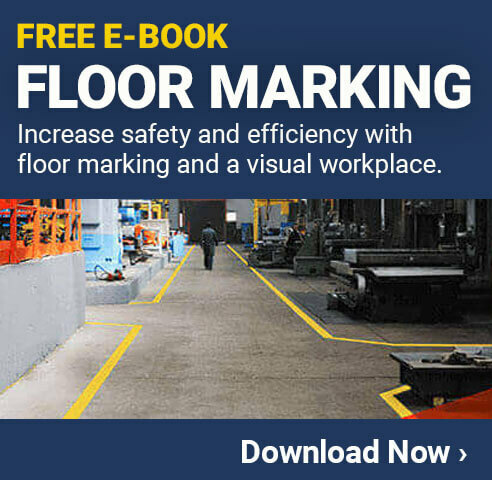 Then share it with colleagues or those in your facility in charge of floor marking. A durable, professional tape can make your facility safe, organized, and efficient.